Behold & Reflect: Asking Myself: "My God, My God! Why have You forsaken Me?" Asking Myself: "My God, My God! Why have You forsaken Me?" This is the 12th post in my series "Asking Myself," in which I weekly ponder one question posed in Teresa Blythe's rich book, 50 Ways to Pray. You can find the start of the series here and last week's post here. The first nine posts focused on theological musings, while post 10 to now prayerfully consider the specific questions Jesus posed in the New Testament. This question comes just in time for Easter. I'm still trying to figure out how to celebrate Jesus' death and resurrection with my kids... but I'm certain I don't want their prevailing impression to always be eggs and bunnies. When they are ready, I want them to wrestle with tough questions, like this one. The tone and theme of the question suggests the asker's deepest trust has been shaken and his deepest love has been severed. A premature twilight has passed over the fiery passion of Jesus' soul. 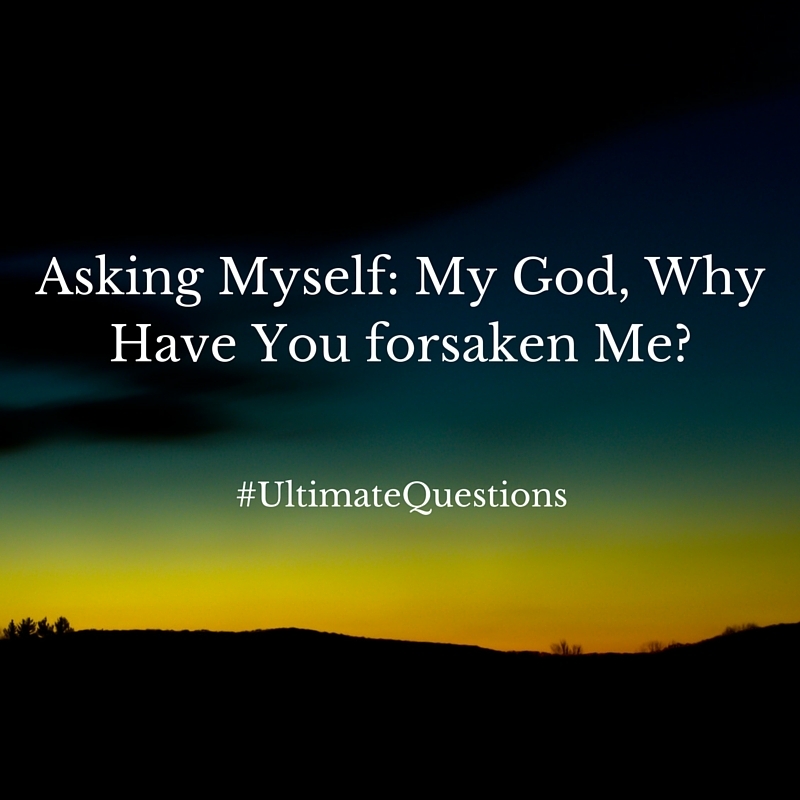 It's difficult to "Ask Myself" this question because I've not felt anything remotely like the agony Jesus must have at the moment he no longer beheld the cloudless face of God the Father guiding him, smiling upon him. No longer feeling the intimacy of being One. I'm not saying the Triune God ceased to be One, but, in that moment in time, in a very real sense, Father and Son were separated. I think it's safe to say there's some mystery here. Make that an awful, blinding mystery that stung like the drops of blood drawn from a thorn-pierced brow and nail-pierced hands. A disorienting, nauseating, numbing swirl of mystery as consciousness was fading in and out. Jesus knew it would happen. But did he fully know—do any of us humans, ever fully know before we experience? When I ponder that dying question, my heart travels to a few places. First, to theological places. Because I don't think that Jesus was just performing a great, tear-jerking drama, I believe his question is authentic. And this means that somehow, Jesus' omniscience was limited. Suddenly, He was abandoned. Suddenly, He felt completely and utterly alone. He felt let down. Did He even feel doubt? Next, I find myself in childhood memories. "Jesus knows all that we've been through. He's faced every kind of temptation and suffering." I used to have a little trouble with this Sunday School assertion. My exactitude and meticulousness would be provoked, and the wheels of my brain would churn out counter-evidence to fact. "Well! He never had to give birth. He never lost a child. He never experienced unrequited romantic love. He never..."
But if I put my inner-stickler aside, I think this moment applies to all those kinds of sufferings and to one even more sinister: Did Jesus, at that moment, feel His life's work might not have been worth it or on the mark? Did he, in that groaning moment, doubt his decisions? Did he wonder if he'd squandered his talents, gifts, blessings, his one, wild life? I don't think he craved a life of pleasure or regretted giving up more hedonistic aims. Those never held sway over Him. Not that he didn't have gratitude for or enjoy life's simple pleasures, just that He was never addicted to an endless stream of comforts. He never allowed Himself to rise to a place of financial wealth or material luxury. Instead, he luxuriated in friendships, in road trips, in helping the needy, in disrupting the dead, in punctuating the status quo, in solitude, in fellowship with the Father. Those were his treasures. Those are the real treasures. And in an instant, it was clear He'd lost them all. As if it weren't enough to face the court of public opinion that He was a liar, Anti-God, Anti-Man--- Might Jesus have actually flickered in His own assurance of His identity? Apart from God. My God! My God! Why? Have You forsaken? Me? I feel the weight of each part of this pleading inquiry, this desperate, shaken-to-the-bone cry. The Message version says, "Jesus groaned out of the depths, crying loudly." I didn't know You and I weren't going to be together in this part of the mission. Are You still my God? Were You ever my God? Jesus is a little unhinged in this question. I don't mean insane, but rather it's like there was an untethering of the Son from the Father. I don't understand the reason. I'm provoked by this sudden development. I saw it coming, I asked You for a different way out, yet here it is, and it's far worse than I imagined. Does Emmanuel not always apply? I've come to depend on You. You were always there, and You've left me utterly. Did I not finish my course well? In a moment, will there even be me? Shall I cease to be? If you're bothered by my imagination's version of this visceral scene and the inner-workings of the crucified mind, so am I.
Pastor-friends, Missionary-friends, Friend-friends, I'm sorry if I appear to have crossed some theological no-trespassing lines into the heresy hinterlands. I'm not trying to argue against Jesus' divinity or God's immutability, or the Trinity's oneness. This is simply my heart's unpacking of this most puzzling Easter question. My focus is on running with the emotions I feel in this scene... because it is the final moment before The Victory. This is utter hopelessness that gives way to the Beginning of our story, of our romance with God. I'm fueled by the idea that God became a man in order to fully know His creation, in order to experience humanity in all its flaws, weaknesses, wounds and perhaps even wonderings. Yes, without sin. But not a superhuman. On that note, I don't know if God incarnate retained his superpowers and super knowledge. Did He simply decide to shut them off for His foray into humanness, his field study into the created realm? Or was He truly limited beyond his control? There are so many implications for humans either way. I wish mainly to consider the ways we humans have felt... perhaps have been... forsaken by God. And I wish to consider the implications of Jesus' near-final utterance to us that suffer this kind of agony. First, the obvious. There are people, millions of people, who not only feel abandoned, but feel they have never met God. They have never heard the name of Jesus and certainly have not known Him as Savior. Add to this existential estrangement, the fact that they live in impoverished squalor. Let's imagine for a moment, even one young woman in Africa. Maybe she has just been in labor for 38 hours, her baby is still born, her insides are ravaged by obstetric fistula, there is no medical care for her on that dirt floor. Her husband abandons her. She is ostracized in the community, a modern-day leper, leaking, stinking, slowly dying. A life that never began. If she is not too weak to speak, this young woman could utter such a question. I don't know how to make the situation OK. I know Jesus hears her ask it, and He asks it with her, remembering the agony of abandonment. I trust His message on the Beatitudes and His words about the least of these being the greatest in the Kingdom will apply to her in eternity. (And now, I can continue to donate to organizations that provide free treatment to women like her. And I can continue to support missionaries who do work among the least-reached people.) But really, at the sheer magnitude of people who are like her, without hope in the world and without access to Hope, I can only pray-ask "My God, My God, Why have you forsaken them?" I know this is the longest blog post ever, but I still want to consider this question for privileged people like myself. If you're able to read this blog post in the comfort and safety of your own home (as I am able to write it), and you've been nourished and taught by other believers enough to grasp even some of what I write, then you, like I am, are among a privileged few on earth. These few have a taste of the possibility of living a worthy, purpose-filled life. A life of encountering God, growing in God and following Him. Yet, at some point, the rug gets pulled out from under them. Perhaps the love of their life has cheated on or deceived them. Perhaps the the diagnosis is terminal. Perhaps their system of belief, in which they were raised and nurtured and excelled, has suddenly been tested, and not passed the test. Are You not really with me? Are You know who You promised? Who am I, if not with You? Is there me without You? 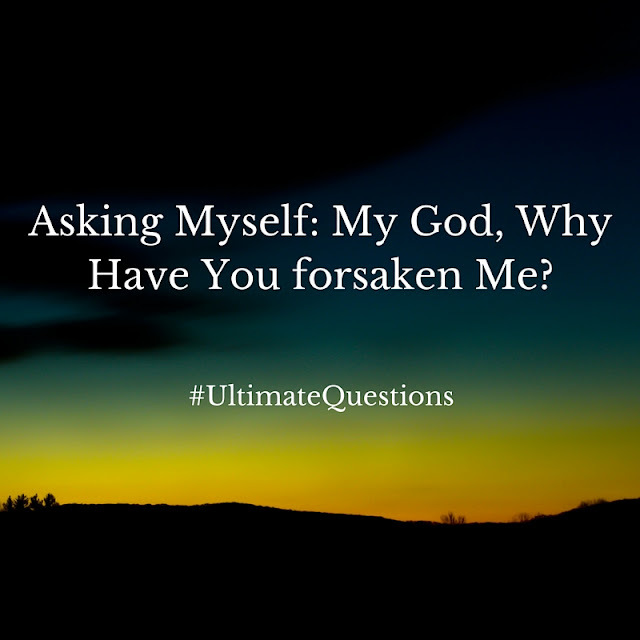 Because Jesus asked it, because Jesus really truly experienced it, and because God inspired it to be written, we have permission, we are encouraged to ask these questions too. Jesus was willing to complicate his reputation so we'd be invited into this conversation, this epic. Like Jesus, we know the end of the story, (spoiler alert: it's a happy one!) yet we don't fully know, and won't fully know until we've passed through these chapters we're in.